Currently browsing posts filed under "Form 990"
Form 990 is an IRS requirement filed by all US non-profits. It is a confusing document that has changed significantly over the years. See here for background reading. Williams only provides versions going back to 2009. Future historians will thank us for archiving older versions: 1998, 1999, 2000, 2001, 2002, 2003, 2004, 2005, 2006, 2007 and 2008. In fact, because Williams occasionally hides things that it once made public, let’s go ahead and save the more recent filings: 2009, 2010, 2011, 2012, 2013, 2014, 2015, 2016 and 2017. Should I spend a week going through the latest version? The College’s Fiscal Year 2015 Form 990 is now available (pdf). Day 5 of a 5 day discussion. We have borrowed about half a billion dollars. The markets are at all time highs. The endowment earned -1% last year. What could possibly go wrong? 1) Are we really $500 million in debt? I am not sure. These Form 990s are confusing! Some debt may have been paid off already. And, most importantly, the endowment is, by now, probably over $2.5 billion. So Williams is still $2 billion or so in the black. 2) Why is there so much debt? Thirty five years of an equity/bond bull market and federal incentives for borrowing will make even the most risk-averse institution aggressive. In 1998, Williams had $72 million in debt. Increasing that by a factor of 7 can’t possibly lead to trouble, can it? Now, to be fair, as a percentage of the endowment, the increase has only been from 7% to 20%, so only a factor of three increase. And, if Williams had been more levered over the last 17 years, we would be much richer today. And borrowing lots of money to buy houses in Florida was a great strategy from 1998 through 2007. Until it wasn’t. Also, note how federal tax incentives (and loose regulations) encouraged such borrowing, both for speculators in Florida a decade ago and Williams today. 3) Is this too much debt? Tough to say! If we could be certain that the endowment, over the next 10 years, was going to go up by 7% (as it did over the last decade or two), then we ought to borrow billions more, since we only pay a few percent on the debt. (By the way, how much do we pay? Fixed income is confusing.) Most professionals, however, expect returns to be much lower going forward. If the endowment is flat over the next decade, then this debt will prove to have been a major mistake. Recall these wise words: Leverage is a dangerous thing, for both hedge funds and small liberal arts colleges. It would have been a bad thing for Williams to reduce debt in the depths of the financial crisis a decade ago. Reducing debt now would be prudent. The College’s Fiscal Year 2015 Form 990 is now available (pdf). Day 4 of a 5 day discussion. Perhaps the best news is that the College did not, I think, waste a lot of money on local spending, at least in 2015. 2) I object to large donations. Alumni give to Williams to support Williams. If they wanted to give to other non-profits like the local hospital or MASS MoCA, they would. Again, the best way to understand the actual behavior of Williams is to imagine that it is controlled by a cabal of selfish insiders, intent on devoting the College’s own resources towards their personal use. Classic example of such selfish behavior include giving $1 million to North Adams Regional Hospital, $250,000 to Mount Greylock Regional High School, and $2 million to MASS MoCA. 3) Although some of the individual donations are reasonable, the total of around $250,000 is way too much. That money should be spent on items that directly impact the quality of the undergraduate experience at Williams. For starters, hire some visiting lecturers so that students aren’t kicked out of popular classes like CSCI 135. The College’s Fiscal Year 2015 Form 990 is now available (pdf). Day 3 of a 5 day discussion. 1) Spending on administrators is out of control. Williams has, over the last 20 years, gone from being a faculty-run college to an administrator-run college. 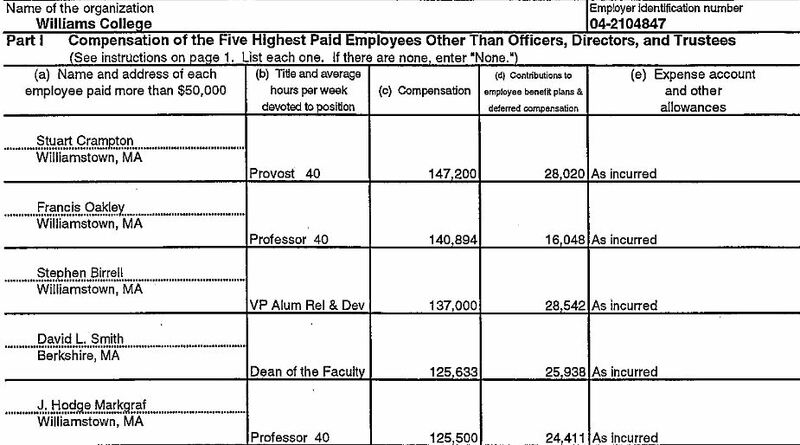 Although Adam Falk continues to talk a good game about “faculty governance,” who do you think has more power at Williams: Steve Klass making $367,000 and talking with the President almost every day or some random (full!) professor making $180,000 and never having shared a meal with Falk? 2) There are 7 people (Reed, Sousa, Puddester, Chilton, Crosby, Klass and Wakeman) whose jobs did not exist at Williams just ten years ago. How did Williams manage to be the #1 liberal arts college without someone doing these jobs? The answer, of course, is that other people (mostly members of the faculty!) did this work a decade ago and they were paid much less for it. The total annual compensation for this group is almost $4 million. Again, the best way to understand the actual behavior of Williams as an institution is to imagine a conspiracy of insiders seeking to maximize their own power and compensation. 3) The need to give one-off payments to encourage retirement is absurd, the fault of out-dated tenure arrangements and the (new) illegality of forced retirement. The best solution is for Williams, going forward, to award tenure as a 30-year (rather than life time) deal. From age 35 to 65, you have the same tenure as Williams professors have always had. But, at age 65, you become an at-will employee, just like the rest of us poor schlubs. Anyone who argues that such a change would materially impact Williams ability to hire high quality junior professors is clueless about the actual state of the academic job market. The College’s Fiscal Year 2015 Form 990 is now available (pdf). Day 2 of a 5 day discussion. Why does the College have to provide housing help to members of the 1%? Steve Klass, a smart and talent fellow, makes over $300,000 per year. Plenty of banks would be happy to lend him money for his (very nice!) house. Of course, if you think of the College has being run by a conspiracy of insiders eager to line their own pockets, this makes perfect sense. The above demonstrates the mechanism by which College spending spirals out of control. (The exact same process is at work in the ever-increasing CEO pay in US corporations.) First, Falk’s compensation is set by incredibly wealthy individuals. The current members of the Evaluation and Compensation Committee are not listed. (More transparency, please!) But, I think that they are usually/always a subset of the Executive Committee and that group is always (?) only permanent trustees (not elected alumni) and, therefore, dominated by members of the 0.001%. Many billionaires wonder how Falk can survive on $768,000! Second, compensation is under Falk’s complete control. Why shouldn’t he pay his buddy Fred Puddester the big bucks? Williams is rich and no one (?) congratulates Falk for keeping expenses down. So, why not increase Puddester’s pay from $365,000 to $442,000 over just the last two years? No skin off your nose! Third, all the usual madness of surveys and consultants has the same effect here as it has in the out-of-control setting of CEO pay. Every NESCAC school thinks that it ought to pay its president, its CFO, its VP of Campus Life at or above the median of all NESCAC schools. Certainly Falk/Puddester/Klass are at least slightly above the median! So, half the NESCAC schools raise salaries this year, and then the other half raise them next year. In the absence of meaningful competition, it is not clear where this process ends . . .
Now, this is slightly unfair since the President has always gotten a house. (By the way, has Falk moved back in yet?) And arranging a golf membership is fairly common, and probably pre-dates Falk’s hiring. I will save a my rant about the absurdity of paying-people-extra-to-quit for another day . . If you think of Williams as being run by a conspiracy of (highly intelligent) self-dealers, then all this makes sense. In fact, the most reasonable prediction is that more administrators will soon have access to these sweetheart deals . . The College’s Fiscal Year 2015 Form 990 is now available (pdf). Day 1 of a 5 day discussion. Form 990 is an IRS requirement filed by all US non-profits. It is a confusing document that has changed significantly over the years. See here for background reading. Williams only provides versions going back to 2009. Future historians will thank us for archiving older versions: 1998, 1999, 2000, 2001, 2002, 2003, 2004, 2005, 2006, 2007 and 2008. In fact, because Williams occasionally hides things that it once made public, let’s go ahead and save the more recent filings: 2009, 2010, 2011, 2012, 2013, 2014 and 2015. Wow! We have been doing this a long time . . . Cumulative inflation between 1998 and 2015 has only been 45% so we would expect the total compensation for Adam Falk and Fred Puddester, Payne and Healy’s successors, to be about $397,000 and $244,000 respectively, right? The actual numbers are $768,000 and $442,000. Williams has raised administrator salaries around 90% more than the rate of inflation over the last 17 years. Note that is hard to make an apples-to-apples comparison with today because the highest paid professors in 1998 may be different — in terms of things like years of service or administrative duties — from the highest paid professors in 2015. Indeed, I am not even sure if items like health care and retirement benefits are included (or excluded) in 1998 versus 2015. However, a compensation of $175,000 for, say, Stewart Crampton ’58 is not out-of-line to the 2015 compensation of $231,000 for Bill Lenhart. In fact, that 32% increase is less than the rate of inflation! The real change that jumps out is the huge increase in highly paid administrators. In 1998, only two non-faculty (Healy and Birrell) made the top 7 in compensation. In 2015, six of the top seven highest paid employees (Wakeman, Crosby, Klass, Puddester, Chilton, Sousa) were non-faculty. 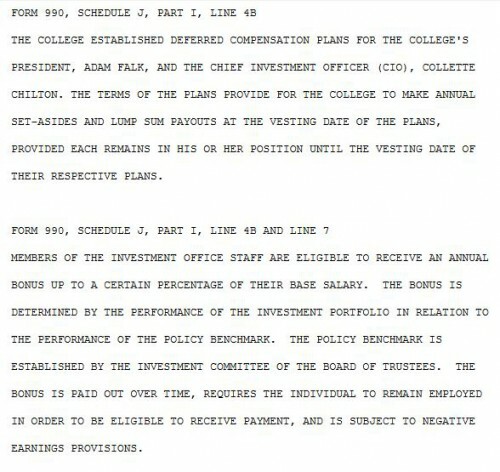 Big kudos to President Adam Falk for fulfilling his promise of greater transparency at Williams by posting the College’s Form 990! 2) Thanks to fellow EphBlogger John Wilson ’64, who has been leading the charge on this topic for several years. This seems to be a clear case in which EphBlog has changed something about Williams. As far as I know (counter examples welcome), Williams is the only elite school which posts it From 990. If it were not for EphBlog’s agitation, I doubt this would have happened. Yeah, EphBlog! 3) Instead of just providing the most recent year, Williams ought to provide all easily accessible years. I originally stored this in Willipedia, but, now, the most accurate listing is at EphBlog, thanks to John’s efforts. Williams ought to add these past filings to the Controller webpage in the same way that it provides historical financial statements. 4) Interested in a two week seminar on the latest Form 990? Me too! But I sure wish that someone else would take the lead on that . . .
Do you think the college could release a list of how much it pays employees? Do other schools do this? I know they probably wouldn’t want to, but I mean, we’re paying the bills–we should know. 1) Don’t kids today read EphBlog? 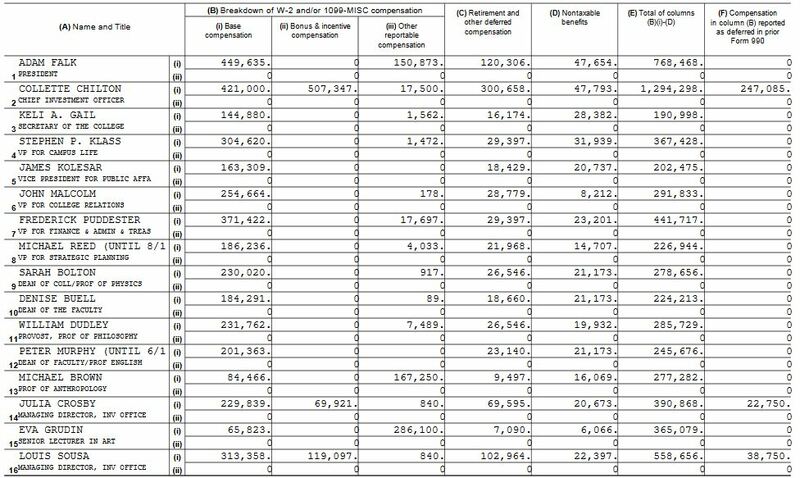 The Form 990s we have collected reveal a great deal about the pay of very senior administrators and faculty. Check them out. 2) The sleaziest pay scandal at Williams involves Chief Investment Office Collete Chilton. Is there a Record reporter interested in this story? Call me. I give excellent quote. 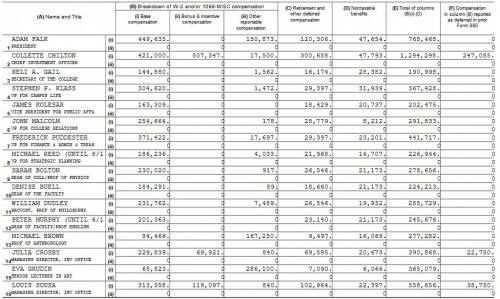 3) Form 990 only lists the 5 highest paid employees, along with senior officers. So, we have very little data on what the vast majority of employees are paid. This is very different than at a state school with open records laws, like the University of California system. In response to a suggestion that Williams be more pro-actively transparent by posting its annual Form 990s, (then) President Shapiro disagreed and said he thought “we were transparent enough.” That is hardly an incontrovertible view, so in the spirit of academic discussion, that position may be examined and challenged. For instance, while it is true that the college (like most private colleges, but not Bennington!) posts its audited financial statements, the detail in these is poor beer compared with the coverage of specific activities shown by the Form 990. An interesting exercise would be a comparison of these two reports and, indeed, one might be forthcoming in this EphBlog space before too long. Such an exercise shows that valuable elements of transparency are added to the college portrait when the 990 is included in the information set. In response to an earlier post on this subject, one comment (by Mike) argued that the Form 990 is “easy to find” (e.g., on www.Guidestar.com) and, therefore, why press the college to post its own? Sure, the Form 990 is easy to find, but only if the user is familiar with the 990 itself, knows about the Guidestar website, and is also a registered Guidestar user. The number of such users is not large among potentially interested parties. Face it: this ain’t easy or obvious for lots of people. Whatever that degree of “ease,” however, it is surely much much easier for colleges to simply offer these reports to their alumni and donors by simply putting them up on their websites. By the way, the arguments deployed here with respect to Williams apply with equal force to all other private colleges and universities (represented by the National Association of Independent Colleges and Universities – NAICU, itself a nonprofit, which offers its own Form 990 here), and also to the myriads of other “charitable organizations” in the current nonprofit universe. There are about 2 million of them, these days. So, this is not to pick on Williams alone. The Williams Form 990 for Fiscal 2008 (viz., July 1, 2007 to June 30, 2008) finally showed up on the Guidestar website yesterday, almost 14 months after the end of the reporting period. For those, like myself, who think this document is very useful and affords more detailed insight into the finances and activities of the college, this is too long a wait. For the last several years Williams has been filing its Form 990 with the IRS at the very outer limit of the permitted reporting window, around mid-May of the following fiscal year. That is, the 4 1/2 month normal reporting limit, plus the 3 month extension granted automatically on request, plus a second (and final) extension, which must also be requested by the reporting institution. That makes the 10 1/2 months of “reporting lag.” Add in the ca. 2 1/2 to 3 months it requires for Guidetar (and others) to acquire this material from the IRS Ogden office, and that accounts for the approximately 14 months before this material becomes “publicly visible” to interested parties on any website. Some other colleges and universities do better, by filing earlier and themselves posting these documents on their own websites, something that will be detailed in a subsequent post in this space. Compare the 10 1/2 month reporting delay and almost 3 month posting lag for Williams with the availability of the college’s audited financial statments, the latest of which was signed by the auditors on September 18, 2008, less than 3 months after the close of the 2008 fiscal year. These, to be sure, are posted, albeit discretely, on the college website, although exact date of posting is not clear to me. In fact, almost all colleges and universities I have reviewed seem to put these accounts up for their constituency to see. But not Bennington! In a post on EphBlog (my first) on July 20, I recounted briefly how Williams President Shapiro said “No” to my suggestion that Williams promote greater financial transparency by posting its annual Forms 990 on the college website. The current post gives the background to the story and, of course, expresses the hope that Williams, under new administration, will “come around” and see the issue from a different perspective. The Form 990, as data nerds know, is the annual information return filed by the majority of 501(c)(3) nonprofit, “charitable” organizations with the IRS. Williams and other private colleges are among those organizations. These forms are to be filed within 4 ½ months after the end of the nonprofit’s fiscal year which, in the case of most educational establishments, is end-June. In certain circumstances a nonprofit can get up to six months additional time to file, but within at most 10 ½ months after fiscal year end, the 990s should be in hands of the IRS. It is useful to note that a Form 990 is, by law, a public document. The filing institution is obliged to make it available on request and/or provide a hard copy at cost, of the most recent three years’ reports. The IRS will also furnish a copy if contacted using Form 4506-A, Request for Public Inspection or Copy of Exempt or Political Organization, the title of which is, yes, a bit of a mouthful. For those “in the know,” recent Forms 990 can also be downloaded from www.Guidestar.org (the nom de web of Philanthropic Research, Inc.) and a couple of other sites. But, there are substantial lags before these documents make it to GuideStar, and in some cases they are not very timely when they get there. In the case of Williams, it has frequently been a year to a year and half (measured from fiscal year end) before Form 990 filings make it to the GuideStar site. The purpose of the current tabulation is to make available in one place the Forms 990 filed with the IRS by Williams in recent years. At the present time, those for the period 1998-2008 are available, but as of 8/15/09 the 2008 filing is not yet on Guidestar. Guidestar presently provides 3 years of Form 990s to “non-premium” members; the rest in this collection come from my private archive. As new filings become available on the Guidestar website (www.guidestar.com ), or from Williams directly, it is proposed to add these, so that the time series of recent filings is gradually extended This post is marked “no comments” to preserve the presentation from accumulating clutter. EphBlog users are welcome/invited to provide their own posts/comments on the contents of Williams’ Form 990 filings as separate contributions in the Form 990 Category of the EphBlog. Williams College is a 501(c)(3) nonprofit organization under the IRC and, as such, files a Form 990 information return annually with the IRS. These are public documents. Nonprofits are required to make their returns available for public inspection on request, or provide copies of them, at cost, for a period of three years. The IRS requires nonprofits to file their returns within 4 1/2 months after fiscal year end, with the possibility of an automatic extension, on request, for 3 months and a further 3 month extension, at IRS discretion thereafter. Thus, within ca. 10 1/2 months after the end of the nonprofit’s fiscal year, reports must be in the hands of the IRS. As noted below, Williams has been filing electronically for the last few years. The IRS also recommends that nonprofits post their Form 990s on their websites. The forms tabulated below are in the more or less stable format in use up until 2007. Beginning with reports filed for 2008ff (after several years of deliberation) the format of the Form 990 was revised and expanded in certain respects. Williams Form 990s for this new regime are not yet available. The 2009 Form 990 presumably will be in the new format. Each of the Forms 990 included below should be in “searchable pdf” format — produced from IRS scans by the OCR in Acrobat 8 — for those who like to go right to some issue or other. In this update of the post, I have included indications of when each Form 990 was signed by the Treasurer’s Office at Williams, when it was stamped as received by the IRS Office in Ogden Utah, and when it was scanned for subsequent transmission to Guidestar. Signature dates on the last few Williams submission suggest they were filed right up against the final deadline. The path from the IRS to Guidestar is a bit convoluted, and may be covered in a subsequent post. Note that, as from the 2006 reports, Williams’ submission has been electronic, so therefore the signature and receipt dates are effectively the same, and there is no longer any need for separate scanning. Without further ado, here they are. Section 7: A charitable organization should make information about its operations, including its governance, finances, programs and activities, widely available to the public…. Several posts under “Form 990” on the EphBlog contain links to forms 990 filed by Williams with the IRS in recent years. Those for 2004 and 2005 seem to be missing. Here, to complete the set, are these two filings. If any reader feels moved to acquire the whole set from the past 10 years, they happen to be living on my computer, and I can provide. For those historians searching for pre-1998 forms 990, it appears to be the IRS standard to destroy these nonprofits’ filings after 10 years, so they may be hard to obtain. The website www.Guidestar.com currently makes available only the most recent three year run for non-premium users. At the present moment, Williams’ 2008 form 990, which should have been filed with the IRS months ago, is not yet posted on Guidestar, but it should be along shortly. When the 2008 filing appears, it will find its way onto the EphBlog like the others. During the recent reunion weekend, in a public meeting, President Shapiro said “No” to the suggestion that Williams should post on its website the Forms 990 it submits on an annual basis to the IRS, even though the information in these forms is, by law, open to the public. Details on this exchange coming shortly. We strive to be completely transparent and accountable to the public and to our donors, and we always publish all of our financial information in our annual reports, which are available on our website. This includes the percentage of our revenue that is spent on fund-raising and administration. Maybe that is why in our eight year history, no one has ever asked for that information. My salary is $77,175, which makes me the highest paid employee at Think New Mexico. Excessive nonprofit CEO compensation is a national scandal and could be stopped relatively quickly by the national foundations that subsidize it. An Eph after my own heart! If Think New Mexico can publish it IRS Form 990 on its website, then why can’t Williams. If Think New Mexico can avoid excessive pay, then why can’t Williams? It’s too bad that Ephs like Fred Nathan and me are powerless to establish these sorts of policies at Williams. 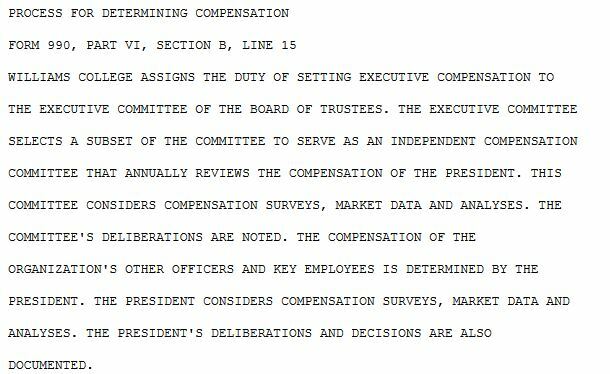 The Presidential Search Committee should just inform that 15 or so finalists that the expected compensation will be around $250,000. Any who don’t want the job unless it pays big bucks are probably precisely the ones that we don’t want to hire anyway. Might a couple of candidates pull out? Sure. But you would still have ten or more amazing folks to choose from, people who think of the Williams presidency as a dream job and not as a way to get rich. If it is good enough for Think New Mexico, it is good enough for Williams. All my leftist friends are always complaining about the rise in income inequality in America. Fine. Now is their chance to do something about it. Will they speak up? 2) I half-heartedly tried to get pre-1998 copies of Form 990 from the College a few years ago. I was told that they were not available. True? I have my doubts. Bureaucracies keep things. The College had to file this form with the IRS in 1997, 1996 and so on. Were all copies destroyed? Finding out and poking around through old data would make for an interesting Record article. Professor Goethals is no longer at Williams, but has often been one of the highest paid profs. In the 1999 form (pdf), his total pay is $177,000. Does the increase over the last 6 years provides a good estimate of the standard raises that Williams has given to all its faculty, i.e., that Goethals did not get any special salary increases in this time? Perhaps. That would suggest that the annual salary increase has been about 2.8% per year, which seems too low. 4) The two biggest investment firms listed among the highest paid outside contractors are John W. Bristol and Hintz, Holman & Heckscher. Does anyone know much about these firms? What do they do for the College? I am perplexed. The College appears to pay them $2 million in total. That seems like an absurdly small amount. One guess is that they don’t do much for Williams (run index-like funds?) and, therefore, get the market wage. Another is that they are actually paid much more but since the money comes directly from the endowment, the College does not report it. That seems sleazy and, therefore, unlikely. 5) Morty’s salary and benefits are $479,000, up from $354,000 his first year. Was Morty 35% more productive/efficient in 2005 compared to 2001? Perhaps! At this rate of growth, the Williams President will be earning $1,000,000 in 2019. What would President Jack Sawyer ’39 say? Classic rant here — one of my all-time favorite posts. 6) What interesting items do you see in the rest of the form? For the benefit of anyone interested in some more details about the inner workings of Williams, here are the College’s Form 990s for the last 6 years: 1998, 1999, 2000, 2001, 2002 and 2003. There is a lot of interesting information here. For now, I just want to highlight the growth in total compensation for the President. In 1998, total compensation was $274,000. By 2003, it was $423,000. Am I the only one that is bothered by that growth? In five years, compensation has increased by more than 50%, or about 9% per year. Eyeballing the intermediate years, it seems like the growth rate is fairly steady, ignoring one outlier year caused by some weirdness, presumably, in Hank Payne’s contract. Has this 9% growth been steady in the past and is it likely to continue in the future? Alas, I have not been able to find a Form 990 from the 1980’s. (Presumably, this must be available in hard copy somewhere in Washinton DC.) But, this trend would suggest total compensation for Frank Oakley of $116,000 in 1988 (which seems about right). As to the future, a member of the board of trustees (a smart and decent guy) said that, when he joined the board, he was surprised that Morty was paid so little. If the growth rate of 9% per year continues, then Morty (or his successor) will break the $1 million mark in 2013. As always, my question to defenders of the current system is not: Is Morty paid too much? 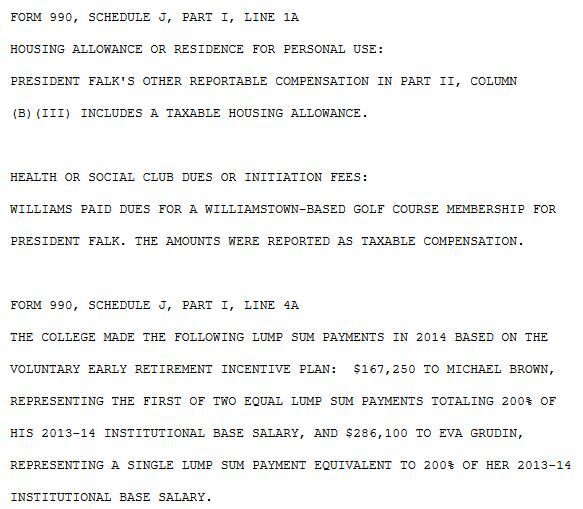 My question is: At what point should I — as a concerned alum from whom the College is always asking for more money — become concerned that the President of Williams is being paid too much? Is it $600,000, $800,000, $1 million, $4 million or what? How much is too much? Tell me now so that I can know when to start worrying. I have little doubt that if I had asked this question in 1988, people — perhaps even Morty himself as my professor in ECON 401 — would have quoted numbers not much greater than $500,000. Related posts on salary issues are here, here and here. Shimon Rura ’03 sent in this message. Today I found guidestar, a site that makes available a bunch of data on nonprofits. If you register with them (for free) you can view wonderfully informative things like the Williams form 990 for fiscal 2002, which I’ve mirrored for your convenience here. According to this document, two of Williams’ most highly paid independent contractors are investment managers, ringing in at $2.3M and $1.2M. Aside from the top 5, 37 other contractors received over $50k for services. Thanks to Shimon for making this data so easily accessible. Of course, the College should, in the spirit of transparency, make this form available for easy downloading from its web site. I’ll try to ask about that. This year’s form should be out soon. One item that jumps out, from the first page of “Schedule A” is that Professors Goethals and Hill made more than $200,000. 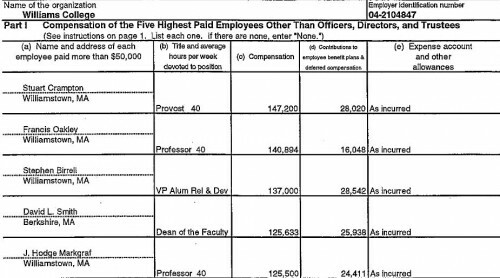 Since Hill is also Provost, there is presumably a rationale for why her compensation is higher than other professors. I am not sure how Goethals ended up so high on the list, although I think that he served as Provost in the past. Turns out that our readers are a knowledgeable bunch when it comes to things like salaries. With reference to this post on college president salaries, a reader who (wisely!) prefers to remain anonymous sent in this information. Several items jump out from this table. 1) Morty makes $400,000 per year (he presumably got at least a small raise for 2003-2004). Whether this is a lot of money or a little money depends on your point of view. I wonder if the large benefits package includes some measure of the housing value of that modest place on Route 2 that he has? 2) Winthrop Wassenar has done pretty well for himself. I wouldn’t have guessed that running the physical plant was that remunerative. Presumably, there is some sort of back story here. I wish that I knew more. 3) The College is still paying Hank Payne! Or, at least they were 2 years ago. Wasn’t that 2 years after he had left? Doesn’t he have, you know, another job now? 4) Note the difference between Schapiro and Payne’s ($290,000 versus $238,000) base pay. Although this might be complicated by Payne’s departure (maybe he only gets, say, 75% of his base pay as a golden parachute), it appears that the trustees have decided that Presidents are worth 25% more than they were just a couple of years ago. Or perhaps this was the amount that they needed to entice Morty away from sunny California. 5) Helen Ouellette has a nice gig. The former president of Williams College, Harry C. Payne, topped the list with $878,222 in salary and benefits when he received a special package related to his departure from the school. His base salary was $232,550. Hmmm. It is unclear whether Payne’s golden parachute included the hundreds of thousands that the college was still paying him in 2001-2002. Perhaps there is some double counting going on. Does anyone besides me find this all . . . troubling? Ben also pointed out an article from the New York Times on the same survey. “It’s not going to be good for higher education if it becomes seen, at a time when tuition is going up, that college presidencies have become a new route to being a millionaire,” says Patrick M. Callan, president of the National Center for Public Policy and Higher Education, in San Jose, Calif. Even so, The Chronicle’s annual surveys of the compensation of public- and private-college leaders show that presidents have not been bashful about accepting raises, nor have boards stopped handing them out. It’s not really the cost that I worry about. It is the culture. Morty now makes twice as much as any other professor and, rough estimate, around 5 times more than recently tenured professors. If that doesn’t worry you, how are you going to feel when it is 4 and 10 or 10 and 25? This is precisely the sort of relative growth that CEO’s of public corporations have seen. For the record, I’ll note (and not just because I want a job from him someday!) that, if any College President is worth $400,000, then Morty definately is. EphBlog is powered by WordPress and delivered to you in 1.486 seconds using 45 queries..